Welcome! 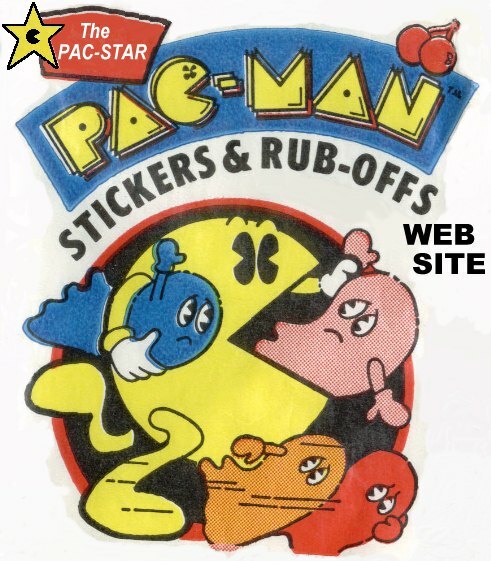 This web site is dedicated to Pac-Man fans, especially those who enjoy Fleer's Pac-Man (or Ms. Pac-Man) Stickers and Rub-Off games. Perhaps many of you bought these bubble gum cards when you were young. Now you can enjoy them again, plus learn everything I know about these cards. At first, it would seem that this product is just one of 1,000 other Pac-Man products produced during the early 1980s. But there's a lot more to these cards than there might seem, making them very interesting for collectors! There are actually four variations of the Pac-Man Stickers and Rub-offs packs, involving different colored wrappers and different sticker graphics? There are also two variations of the Ms. Pac-Man Stickers and Rub-off packs (though more subtle)? If you buy an unopened package of Stickers and Rub-offs from E-Bay, then try to scratch off the rub-off game, it won't work anymore? Fleer also produced Super Pac-Man Stickers and Rub-offs? Fleer also produced Stickers and Rub-offs for Dragon's Lair (another video game) and Robot Wars (non-video game)? Rival company Topps produced Donkey Kong Stickers and Rub-offs? tOkKa's photostream on Flikr: High resolution scans of about 17 Pac-Man and Super Pac-Man Fleer stickers. StickeryGirl's photostream on Flikr: Fleer stickers and other Pac-Man stickers. The Pac-Star is not yet a member of Pac-Land, but a happy promoter of it! Waka Waka! Want to join the Pac-Land ring? Click here. Document last modified 06 Jun 13 by Kevin Jay North; see also full copyright notice & disclaimers.